Her sculptures are timeless and lifelike, echoing a connection to the traditional African heritages of our native mothers and grandmothers. Toiling away in her home studio for hours each morning, artist Lindy Lawler has created pieces of African culture that are fast becoming sought after and treasured by her growing market client list and boutique galleries across Sydney. Constantly perfecting her craft, which started as a hobby some 11 years ago with the birth of her daughter, Lindy has studied and researched the essence of sculpting, perfecting her moulds and technique with every piece fired until she was comfortable enough to share them on a public forum. Taking her unique pieces to select artisan markets within Sydney, word soon began to spread about her works and the rest as they say is history. 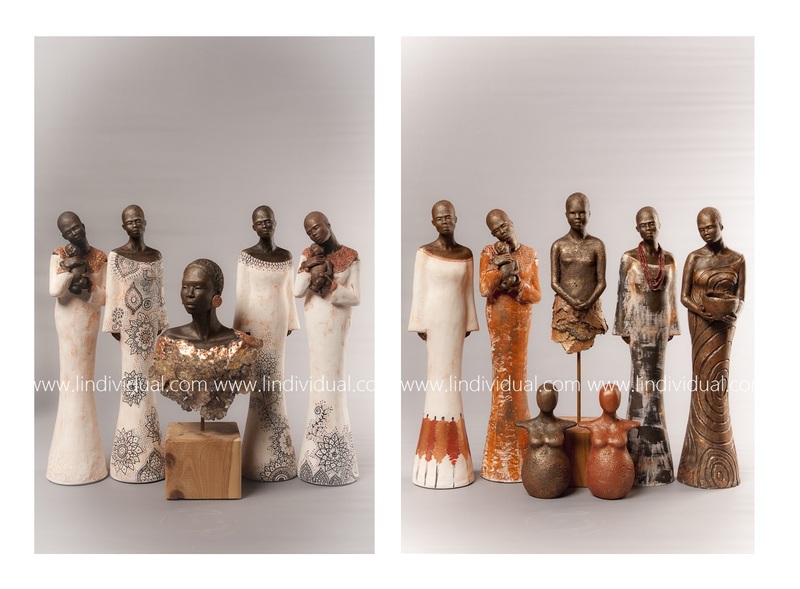 Her pieces are intrinsic of tribal figurines of a beautiful African heritage, paying homage to her strong ancestral links to her South African roots and invoking a sense of connection and belonging between the human hand and raw earth. As her passion for clay and sculptures of her native childhood memory continues to grow, so too does public interest and praise for her talent and creativity. Stepping out of her home studio in Sydney’s Western suburbs, Ms Lawler has taken to teaching sculpting at a variety of pop-up art classes in and around the Parramatta area, and is gaining deserved recognition for her stunning works. Read on to discover more about Lindy’s journey and how she has morphed from a hobbyist sculptor into an in-demand-gallery-consigned-muliti-media artist on the rise! How long have you been an artist / sculptress? How would you best describe what it is you do and what started you off on your creative journey? I’ve been sculpting since my daughter was born 11 years ago, however I have had my hands in creativity from a young age – I drew people, animals, hands, took portrait photographs etc. I’ve always had an amateur interest in tribes, cultures, archaeology and ancient history. The fact that art pieces, spiritual sculptures and every day normal items were used by groups of people in worship, decoration or everyday use thousands of years ago deeply speaks to me. I love seeing archaeological finds in museums or photographs of tribes and cultures in the middle of what we consider ‘nowhere’, and I love seeing ancient art – especially sculptures and symbols of women. When my daughter was born, I serendipitously picked up a block of clay, and as they say, the rest is history. Since then it’s been a journey through different clays, taking the time to learn the qualities of each clay and what it could do for me. I feel as if I have finally ‘arrived’ in my use of ceramic clay, however I’m grateful and respectful to all the mediums I learned from in the process. Portrait photography has especially helped me with my sculpting. I find the two to go hand in hand with each other. Not only am I learning about the structure of the face, or how light falls and casts shadows, I’m also learning about the essence of the people I’m photographing. I find that also comes out in my sculptures. Why sculpting? What is it about the process that appeals to you and brings takes your creativity to a higher level? My close family call me a hippy. My friends often ask what organic meal I am preparing, or if I wear any makeup. I’m very much about the natural, the raw and the true. The process of sculpting brings me right back to that grounding Earth under my feet, and from there I work with the clay to manifest the ideas in my mind. This alone is very therapeutic, but I’m using something we don’t consider beautiful every day, something that is not flashy nor conventionally attractive – the clay of the Earth, the soil under our feet – and I’m bringing out the beauty in it. For a medium to work with my hands and my mind, to adapt to different designs and ideas -that shows me the beauty of what can happen in co-operation between man and the Earth. This ancient connection is very important for me to foster. Your pieces are undeniably beautiful and resplendent in their honour of Mother Africa and the women we have grown up around as children in South Africa. What was is about that image of an African woman that sparked your artistic fire and made you want to recreate their images in clay? My memory of African women was really not at all of their exterior. I was reminded of their behaviour towards me – the essence of their inner spirit, how they worked, laughed, sang, cried; how they cooked, held the babies, gossiped, mourned, worshipped. There was and still is a certain elegance in these women that remains with me to this day. It was only fitting that my hands create something that reflected this spirit using the materials I respect and honour so much. To be honest, I find our current idea of conventional beauty rather shallow and clone-like. Mother Africa is filled with symbolism. There is beauty not simply within how people are dressed or their decoration, but within their treatment of others, and what comes from their connection with one another. I am very interested in this aspect of Africa – an aspect that harks back to ancient times and is filled with symbolism. I my hear collectors tell me they have seen African artwork before but they have never felt it until they saw my work. I want to dig deeper and show the beauty of the inside. I hope my pieces are symbolic of this. Describe a day in the life of yourself before, during and after your sculpt process? What music do you play to get you in the creating mood? I’m balancing family life, a full time job and my art. A typical day includes a good 4 hours in the studio, often with a documentary playing in the background. I prepare all my tools when I get into my studio, switch on my TV and put a documentary into the player, run warm water into a large bowl and unwrap the piece/sI am currently working on. Then it’s game on – I rework pieces, sit and look at other pieces, roll out and ‘firm up’ slabs of clay, pour casts for my reproduction range, wipe up mess as I go and vacuum up dust – until my alarm goes off and reminds me of the domestic duties 🙂 If I’ve run out of documentaries, I’m playing Sade, Sting, listening to Toumani Diabate or having a great old laugh listening to our politicians during Question Time! Your work has been picked up by a boutique style African Gallery in Terrigal (Sanaa Afrika)– congratulations on such an amazing achievement! Tell me how that came about and what does this mean for your work schedule now that you are in a space where people can purchase at any given time? I was contacted by Carina – who operates the gallery – to bring up some of my work. She has been operating the gallery for about a year with her husband Samuel. They focus on African Art by African artists, which is wonderful for me as my work fits this perfectly. I’m happy to have met them and to have my work in their gallery as I’m quite selective as to where my pieces are sold, and I really want people to hear the story of my art when they purchase from me. Carina’s gallery allows collectors to learn about the artist and why they create their works – something I’m very happy about. Current larger pieces are popular with collectors at my art markets. I’m creating individual ceramic ladies that are quite tall – each is different to the one before and reflects its own individual style. My smaller reproduction range is just as important for those who would like my work – I’m casting new pieces once a month and decorating through the month, and then I bring selective ones with me to art markets. It’s always busy! How important do you believe it is that through all the modern technology we have today and people creating artworks digitally and through IPAD applications, that a person gets to actually see paint on canvas, hands sculpting clay and any other art form that is devoid of modern interference but calls back to the earth –like your pieces do? Everything has its place. Digital artworks serve another area of creativity and encourage interaction with users. I respect it based on the period of time we are living in. For myself however, there is a learning curve going on within me in each and every piece I create, and I believe these learning curves require me to work with the clay and reshape it from the block I receive it, to create what is in my mind – a rebirth perhaps? Describe your different methods of creating your beautiful pieces? Different clays, methods , paints, materials used and the names you come up with to adorn your creations? The whole process must be incredibly holistic! Creating my reproduction range begins with a rough sketch in oil based clay of the figure I want to sculpt. I will roughly form the figure so I can see the size and pose. Then I will spend weeks refining the sculpture – cutting away bits here, adding bits there… I’ll bring it in to the house when I’m done and put it on my mantel piece for a few weeks. From there I scrutinize it every time I pass by, shaving off a little of the clay or adding a bit more to certain areas. After all this fault finding, the piece is ready to have its mould made. Once that’s done, I cast reproductions in my studio. Once they have had a week or so to set, I begin adding colour. You had had a piece on display at the 2012 Sydney Art Expo — how did that feel knowing so many people could see your work and possibly want it in their homes? Yes, I did have a piece on display with Sanaa Afrika (the gallery in Terrigal). It was lovely to be immersed in the atmosphere of the exhibit – I’m more excited about being around other artists and other art than acknowledging people want my art in their homes. I really enjoy the connections with new people that my art pieces have brought me. The art community is vast – and the great thing about it is I’m yet to meet them all 🙂 My network grows every time I meet someone who perhaps sees themselves as an artist but hasn’t made a commitment to it yet; or when I meet someone who aspires to be an artist; or when I meet an established artist who has been refining their craft for a lifetime. I don’t limit my networking to just established artists as I am inspired by so many people who are beginning or restarting or refining their own artistic journeys. Where do you see yourself in 5 years from now with your sculpts? What are you currently working on? In 5 years I’d like to be making much larger pieces. I’d love to have a shop and be able to completely fill it with my works and the works of other artists who have similar symbolic messages. I’d like to expand my range to include depictions of other cultures as well. At the moment I’m still producing my current open edition and one off art pieces, but I’ve also begun working on limited relief sculptures. What would you say your mission statement in life would be and why? I love a saying by the Oracle of Delphi – “Know Thyself”. It’s more of a reminder I guess, a saying that guides a lot of my decisions. And one I want to live so my daughter lives by it too. People can come and visit you and purchase your pieces at your stall at various markets throughout Sydney — can you share those details as to what markets on what days? I’m at 2 markets a month most months. ← Kristen Fletcher Trio – A Touch of Jazz!